With a Brazilian World Champion there was much demand for a Grand Prix in Brazil and, having run a non-championship event in 1972, the Brazilians won the right to stage a World Championship event at Interlagos in 1973. The event was held a fortnight after the race in Argentina and so all the teams went directly there. As the field in Argentina had been a small one the field was only 20 in number with the only new face being local man Luis Pereira Bueno who rented an old Surtees for the event. This was not his first F1 experience, however, as he had rented a March the previous year for the non-championship event. Team Lotus had done considerable testing at the track in an effort to give Emerson Fittipaldi a chance to win in front of his home crowd but as things turned out it was his team mate Ronnie Peterson was on pole position with Fittipaldi second, two tenths of a second slower. There was then a gap of 1.3secs back to Jacky Ickx's Ferrari (which was on the outside of the front row). The second row featured Clay Regazzoni's BRM and Denny Hulme's McLaren with the third row being made up of Carlos Pace (Surtees), Carlos Reutemann (Brabham) and Jackie Stewart (Tyrrell). The temperatures were very high on race day and at the start the Brazilian crowd was rewarded with two really good starts from the stars they had come to see: Fittipaldi took the lead and Pace leapt through into second position with Stewart third, Peterson fourth and Ickx fifth. On the second lap Pace was pushed back to third by Stewart and he soon dropped behind Peterson as well. The Swedish driver then closed up to Stewart and battled for second place until lap six when Ronnie suffered a wheel failure and crashed heavily. By then Ickx had moved to third place ahead of Pace, who was in trouble with a rear suspension problem which forced him to retire a few laps later. The order at the front remained unchanged while the excitement was provided by Hulme driving up through the field. 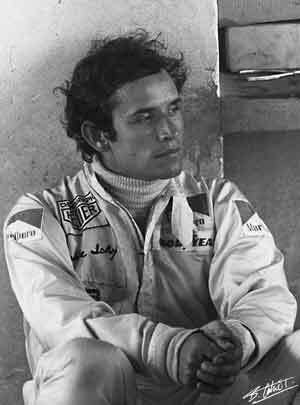 On the 12th lap he overtook fourth-placed Jean-Pierre Beltoise (BRM) and three laps later he passed Ickx for third. The Belgian had to pit with a puncture and so fourth place went to Beltoise until the French stopped with an electrical problem. Regazzoni then moved into fourth but almost immediately had to pit for new tires and so the position went to Arturo Merzario in the second Ferrari.